Two Bears Farm and the Three Cubs: That's so Un-Fair! For July 4th we decided to head to the fair. We got everyone sunscreened up, topped off bellies, and headed out. Thirty minutes into the drive Paul said, "Where is the Salem Fair, anyhow". My answer? "In Salem". This resulted in several phone calls to friends to find out it was at the Salem Civic Center, where we had figured it would be all along. 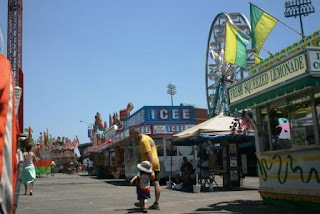 Paul and I decided to do a walk through first, see the sights and take Pierce on a few rides, before going to see the really good stuff - all the animal exhibits, quilting shows, and blue ribbon pies that are the meat of any good country fair. 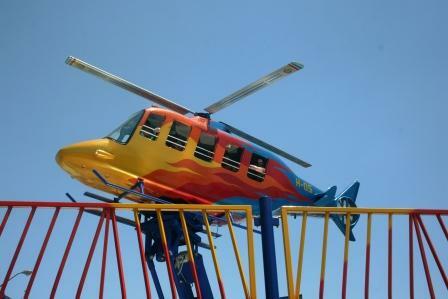 Pierce first requested to ride this helicopter because why? 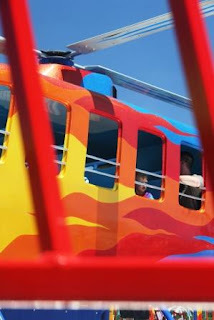 Because Diego rides in a helicopter, of course. Prices at the fair are steep these days. $4 per person to ride this thing. I remember when I was a teen we'd go to the fair for the night and $20 would cover all my rides plus a funnel cake. Not anymore! After that was a little train followed by the Super Slide. 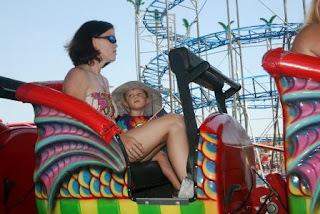 And last but not least, a little rollercoaster with mom. We were surprised he picked this out. 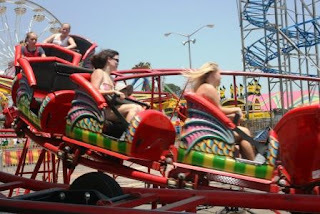 After 3 trips around, the coaster pulled to a stop and Pierce practically leaped out, exclaiming, "I'M ALL DONE!" 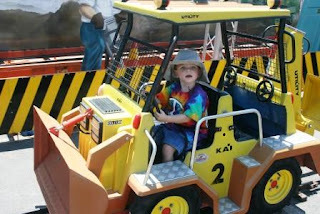 So, rides out of the way, it was now over 90* and scorching hot, and we were ready to go see some exhibits. We entered the Civic Center and saw rows of more propaghanda than exhibits. Need to buy a new mattress? You will now be pleased to know one can be purchased at the fair. How about a new cell phone? Sunglasses? Want to find God? 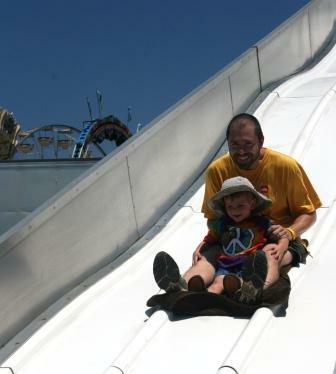 Yes, folks, you can do all this and more at the fair this year. Where were the rows of prized cows? The jars of zesty pickles and canned onions? Where were the crocheted doilies, and best in show crazy quilts? Sadly, they were not to be found. Indeed, our entire raison d'etre at the fair was a huge let down. Mattresses, not maple syrup, was all we could find. The last great fair that I remember going to was the New Mexico State Fair - back when I was in elementary school. I know the 4-H is pretty active her. 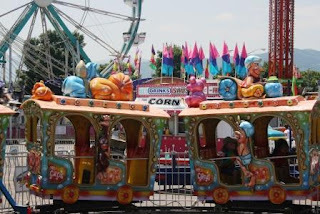 However, it still feels like the fair has been less and less about what a fair has been traditionally and more about what commercial product we can push on you. what a let down! 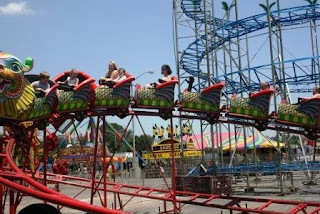 We should all get together and go to the Virginia State fair in the fall. It's not the best fair i've ever been to, but at least they have livestock! Glad you guys had a great time though. Fairs just aren't what they used to be. It was $20 just for Mad to ride 3 rides at our little fair a while back. CRAZY!! Then they didn't have any of the other stuff you were talking about. What? 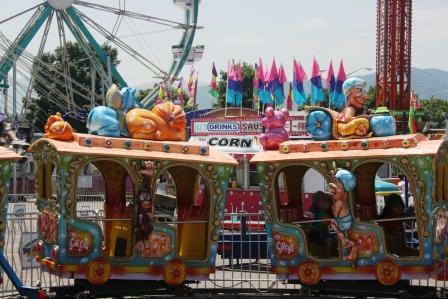 When did the fair sell out and go commercial? Unfair is right! 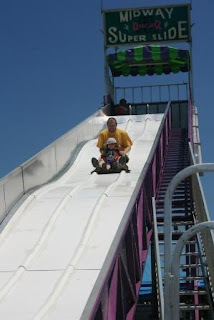 I loooove giant slides, but not so much spinny rides---they make me too dizzy! Sorry all the "real" fair stuff had sold out and gone commercial! And on the Fourth of July also! sounds like fun. New follower from MBC!